A report published by the United Nations Environment Programme (UNEP) and Interpol says that the value of environmental crime is 26 per cent larger than previous estimates. It has become the world’s fourth largest criminal enterprise after drug smuggling, counterfeiting and human trafficking. Environmental crime has grown to US $91-258 billion at present compared to previous estimates of US $70-213 billion in 2014. Weak laws and poorly funded security forces have been unable to prevent organised crime syndicates from illegal wildlife trafficking. 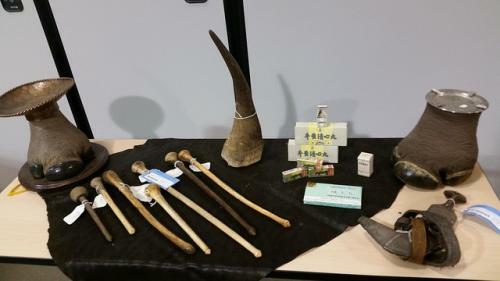 According to the report, environmental crime dwarfs illegal trade in small arms which is valued at about US $ 3 billion. “Environmental crime is growing at an alarming pace. The complexity of this type of criminality requires a multi-sector response underpinned by collaboration across borders,” Jürgen Stock, Interpol’s secretary general, said. Interpol, in collaboration with other forces, is working relentlessly, to prevent wildlife crimes across the world. The report points out that more than one quarter of the world’s elephant population has been killed in the past 10 years. Some of the world’s most vulnerable animals, including rhinos and elephants, are being killed at a rate that has grown by more than 25 per cent every year over the last decade. During the same period, poachers have killed an average of 3,000 elephants per year in Tanzania. In this country, the Selous Game Reserve is famous for African elephants. But due to rampant ivory poaching, the elephant population has declined by 90 per cent in less than 40 years. According to the WWF, nearly 110,000 elephants once roamed the savannahs, wetlands and forests of Selous, but now only about 15,000 remain in the ecosystem. It warns that the elephant population would be decimated by 2022 if large-scale poaching is not prevented. The analysis, produced for WWF by the Dalberg Global Development Advisors, a policy advisory firm, shows that the loss of elephants would have a negative effect on Tanzania’s economy, putting the livelihoods of 1.2 million people at risk. “Selous is the only natural World Heritage site in southern Tanzania and one of the largest wilderness areas left in Africa. Its value to Tanzania—and indeed to the rest of the world—is dependent on its large wildlife populations and pristine ecosystems,” said WWF-Tanzania Country Director Amani Ngusaru. In 2014, UNESCO placed Selous on its List of World Heritage in Danger due to the severity of elephant poaching. UNESCO has expressed concerns about other harmful industrial activities threatening the reserve such as mining, oil and gas exploration and dam construction.